The example displays an array of characters which the user can click on to enter text in a line edit. The contents of the line edit can then be copied into the clipboard, and pasted into other applications. The purpose behind this sort of tool is to allow users to enter characters that may be unavailable or difficult to locate on their keyboards. 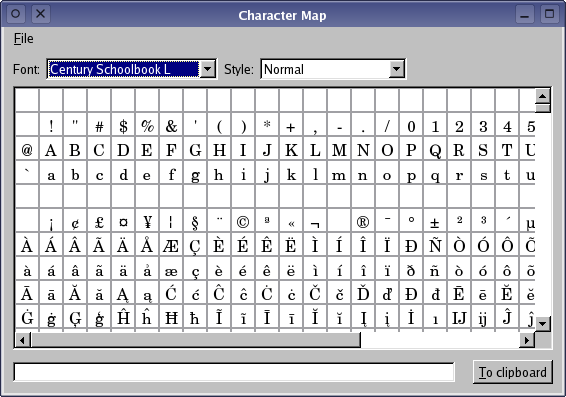 CharacterWidget displays the available characters in the current font and style. MainWindow provides a standard main window that contains font and style information, a view onto the characters, a line edit, and a push button for submitting text to the clipboard. The CharacterWidget class is used to display an array of characters in a user-specified font and style. For flexibility, we subclass QWidget and reimplement only the functions that we need to provide basic rendering and interaction features. The widget does not contain any other widgets, so it must provide its own size hint to allow its contents to be displayed correctly. We reimplement QWidget::paintEvent() to draw custom content. We also reimplement QWidget::mousePressEvent() to allow the user to interact with the widget. The updateFont() and updateStyle() slots are used to update the font and style of the characters in the widget whenever the user changes the settings in the application. The class defines the characterSelected() signal so that other parts of the application are informed whenever the user selects a character in the widget. As a courtesy, the widget provides a tooltip that shows the current character value. We reimplement the QWidget::mouseMoveEvent() event handler and define showToolTip() to enable this feature. The columns, displayFont and currentKey private data members are used to record the number of columns to be shown, the current font, and the currently highlighted character in the widget. Since the widget is to be used as a simple canvas, the constructor just calls the base class constructor and defines some default values for private data members. We initialize currentKey with a value of -1 to indicate that no character is initially selected. We enable mouse tracking to allow us to follow the movement of the cursor across the widget. A QPainter is created for the widget and, in all cases, we ensure that the widget's background is painted. The painter's font is set to the user-specified display font. Using integer division, we obtain the row and column numbers of each characters that should be displayed, and we draw a square on the widget for each character displayed. We do not need to take into account the difference between the area displayed in the viewport and the area we are drawing on because everything outside the visible area will be clipped. The mousePressEvent() defines how the widget responds to mouse clicks. We are only interested when the user clicks with the left mouse button over the widget. When this happens, we calculate which character was selected and emit the characterSelected() signal. The character's number is found by dividing the x and y-coordinates of the click by the size of each character's grid square. Since the number of columns in the widget is defined by the columns variable, we simply multiply the row index by that value and add the column number to obtain the character number. If any other mouse button is pressed, the event is passed on to the QWidget base class. This ensures that the event can be handled properly by any other interested widgets. The tooltip is given a position defined in global coordinates. The MainWindow class provides a minimal user interface for the example, with only a constructor, slots that respond to signals emitted by standard widgets, and some convenience functions that are used to set up the user interface. The main window contains various widgets that are used to control how the characters will be displayed, and defines the findFonts() function for clarity and convenience. The findStyles() slot is used by the widgets to determine the styles that are available, insertCharacter() inserts a user-selected character into the window's line edit, and updateClipboard() synchronizes the clipboard with the contents of the line edit. QScrollArea provides a viewport onto the CharacterWidget when we set its widget and handles much of the work needed to provide a scrolling viewport. We also obtain a clipboard object so that we can send text entered by the user to other applications. Most of the signals emitted in the example come from standard widgets. We connect these signals to slots in this class, and to the slots provided by other widgets. The font combobox's currentFontChanged() signal is connected to the findStyles() function so that the list of available styles can be shown for each font that is used. Since both the font and the style can be changed by the user, the font combobox's currentFontChanged() signal and the style combobox's currentIndexChanged() are connected directly to the character widget. The character widget emits the characterSelected() custom signal when the user clicks on a character, and this is handled by the insertCharacter() function in this class. The clipboard is changed when the push button emits the clicked() signal, and we handle this with the updateClipboard() function. The font combobox is automatically populated with a list of available font families. The styles that can be used with each font are found by the findStyles() function. This function is called whenever the user selects a different font in the font combobox. We begin by recording the currently selected style, and we clear the style combobox so that we can insert the styles associated with the current font family. We use the font database to collect the styles that are available for the current font, and insert them into the style combobox. The current item is reset if the original style is not available for this font. The character is inserted into the line edit at the current cursor position. str << "\n\nDefault font : " << defaultFont.family() << ", " << defaultFont.pointSizeF() << "pt\n"
<< "Fixed font   : " << fixedFont.family() << ", " << fixedFont.pointSizeF() << "pt\n"
<< "Title font   : " << titleFont.family() << ", " << titleFont.pointSizeF() << "pt\n"
We copy all the text from the line edit to the clipboard, but we do not clear the line edit.